Paul Mason’s book on “some of the biggest events in our lifetime” takes us on a journey from the Tunisian revolution to the occupation at Wall Street but raises more questions than it answers about what happens next. Corinna Lotz reviews Why it’s kicking off everywhere. From the winter of 2010 to the end of 2011 the world experienced some of the biggest events of many people’s lifetimes. Uprisings, revolutions and mass demonstrations in North African and Arab states led to the downfall of autocrats who had ruled for decades. Towards the end of 2010, huge numbers of university students and school pupils marched in central London against increased tuition fees and abolition of the Education Maintenance Allowance, a state subsidy that helped some 647,000 youth in the UK continue in further education. Young people in Spain, Greece, the United States and Britain were in turn inspired by the courage of Arab youth in Tunisia and the mass gatherings in Cairo’s Tahrir Square, to hold their own occupations, marches and assemblies. BBC journalist and author Paul Mason experienced these movements at first hand, covering, as he came to realise, “some of the biggest events of our lifetime”. He was one of the first BBC journalists who was allowed to write his own blog and broadcast from the online virtual world of Second Life through an avatar. 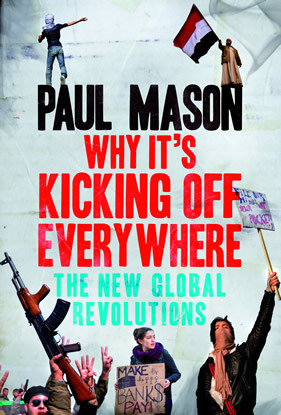 In Why It’s Kicking Off Everywhere, Mason provides a closely observed, sharply detailed account of the people at the heart of the upsurges and the cultural, political ideas which inspired them. His book focuses on why – at this particular time – did a new generation take to the streets to demand their rights, denounce and, in some cases, overthrow their governments? The previous comparable period was in 1989, when mass movements overthrew Stalinist rule in Eastern Europe. And before that you had to go back to 1968, the year of the French student revolt and workers’ general strike and the Prague Spring in Czechoslovakia. As Mason points out, the main intellectual contributions from the left during this intervening period [were] “effectively rationalisations of defeat”. Frederic Jameson and other post modernist theorists essentially agreed that the majority in society had been bought off, physically and psychologically. They argued that capitalist consumer society and its attendant technologies were a one-way system that provided corporations and governments with yet more means of keeping the population passive and under control. In their dystopian view, the products of technology created essentially supine people who could be influenced, brainwashed, monitored and manipulated. This essentially Marcusian-Frankfurt School outlook has been carried on by thinkers like Edward Herman and Noam Chomsky in Manufacturing Consent, first published in 1988. They saw the media as one that enabled capitalist rulers to “assert a new cultural dominance”. Mason notes that in their revised introduction to the 2002 edition, Chomsky and Herman considered the expansion of the Internet in the 21st century as simply reinforcing corporate propaganda. The general line amongst most left or radical thinkers has been, and remains, that the development of today’s technologies – part of what Marx and others term “the means of production” – is a non-contradictory, one-dimensional, mono-valent (to use philosopher Roy Bhaskar’s expression) phenomenon – which must perforce produce system-compliant human beings. New media expert Ukrainian Yevgeny Morozov, continues this stance in his 2012 book The Net Delusion – How Not to Liberate the World, arguing against what he terms “cyber-utopianism”, linking it to the triumphalism that followed the downfall of the Soviet Union. Mason points to others, such as popular cultural philosopher Slavoj Zizek, who tend to conflate consciousness with ideology – “arguing, effectively, that ideology is consciousness”. This point of view, Mason rightly notes, makes it “impossible to escape the mental trap created by capitalism, because one’s life inside the system constantly recreates it. Instead of rebellion, we are reduced to perpetual cynicism”. When you add all this up, he concludes, what you have is the mindset that “nothing can change. Dissent is not strong enough to break the media’s stranglehold; only irony or flight are possible”. But then, on 15 September 2008 – the day Lehman brothers went bust – a huge pin pricked the credit-debt bubble that buoyed up the financial and economic structures underpinning the turbocharged, corporate-driven globalisation of the last decades. In his chapter Error de Sistema – economic causes of the present unrest, Mason gives a vivid account of how the uncontrolled expansion of credit at the beginning of the 21st century created vast toxic debts. “This was no ordinary decade,” he writes: “The scale of the property bubble, the scale of global capital flows, the scale of speculation and of the mismatch between consuming and producing countries was unprecedented”. While he recognises the crucial effect on consciousness of the meltdown that began in 2008 and which is still unravelling, there is an underlying flaw in his approach. His explanation for the financial meltdown never investigates or explains its roots and begs the question of why. It is simply put down to “globalisation and the resulting monopolisation of wealth by a global elite”. His view is essentially that the bubble and subsequent meltdown is a problem of “financialisation” – i.e. confined to the money system and its over-preponderance with capitalism as a whole. He does not relate the debt crisis to the underlying contradictions deeper within the capitalist system which led to the over-production of commodities, and eventually, trillions of dollars worth of debt, cut loose from its original relationship with the creation of real value. And what in turn drove that process? Nothing less than contradiction inherent in the creation of surplus value through the exploitation of unpaid labour time. As technology develops and productivity increases, the commodity in question contains less and less value, which in turn puts pressure on the rate of profit. The constant growth impulse within the capitalist system of production is its way of trying to overcome this tendency of the rate of profit to decline. More and more commodities not only have to be produced – they have to be sold in the marketplace to realise the value they contain. In the most recent period of intense globalisation which began over 30 years ago, this expansion and consumption was increasingly financed by debt which, as profit opportunities fell in the first years of the 21st century, itself became the source of new opportunities to make money out of money. The crash was precipitated by the failure of some US homeowners to repay mortgages which had been bundled up and resold. In terms of consciousness, the credit crunch moment marked the beginning of the end of two decades of “capitalist realism” – the nostrum that, with all its faults, the globalisation would keep on delivering. Or at least on the fronts that “mattered” in the more or less affluent capitalist societies in the West and developing countries like China, India and East Asia and Latin America. “The revolts of 2010-11 have shown quite simply,” writes Mason, “what this workforce [‘the ideal workers of the global age’] looks like when it becomes collectively disillusioned, when it realises that the whole offer of self-betterment has been withdrawn”. By focussing on the concrete reality of the uprisings which took the cynics off their guard, his book underlines how the rationalisations put forward by the theoreticians of post-modernism and most lefts failed to investigate contending dynamics within the system. The book’s chief strength lies in its sharply and sympathetically-observed account of how a written-off generation abruptly entered into broad political struggles and how it has embraced and made use of social media technologies to register its disappointment and anger. The financial crisis, and its economic consequences coincided with a generational change that has produced a living contradiction: individuals who are highly networked, both with their immediate circles of friends and young people globally. The result was that school leavers and university graduates suddenly found their expectations for the future cancelled. This produced, as Mason catchily puts it: “The Jacobin with a laptop”, and in the case of developing countries, “a Masai with a mobile”. Most of today’s 15-to-30-year-olds now embrace part or all of the “full suite” of internet communication – including Twitter, Facebook, Blackberry Messenger, mobiles/YouTube, Flickr, blogging. And this in turn has brought “an expansion of the power of individual human beings”. What mattered was not just that Egyptian and other youth used social networking but “what they used those media for – and what such technology does to hierarchies, ideas and actions”. And Mason believes, with French neo-Marxist Andre Gorz, that “the network has begun to erode power relationships which we had come to believe were permanent features of capitalism”. In Greece, the Anomic State, Mason looks at the effect of the debt crisis on the state in that country. The use of the word anomic – which means unstable or alienated, is telling. The size of the Greek state is being massively reduced as assets are sold and the public sector reduced, along with the wages of its workforce. This in turn, has meant that the Greek state began to lose its grip on the actual functions a state should perform. He quotes Antonis Papayiannidis, who told him that the Greek political class “have lost all connection to the Greek people. They have no legitimacy”. Instead of “manufacturing consent”, consent went up in flames in Athens. And this crisis of political legitimacy, which has allowed far right parties in Europe to advance electorally, is not of course confined to Greece. It is the political consequence of a financial meltdown that no government or political class can find a solution for or control. In a graphic comparison taken from the movie Alien, Mason says the effect of the debt crisis was that “the state became the barrier that contained the acid blood of toxic debt”. But, “not all states, or state formations, were strong enough to absorb the acid bath of bad debt they were being asked to take”. Strategic institutions corroded to the point of failure include the Eurozone, British social democracy, bipartisanship in American politics and the network of Western-backed dictatorships that ran the Middle East. This crisis of the state goes side by side with “the almost total disconnect between official politics and large sections of young people”. It is in his discussion of Marx’s ideas about technological advance that Mason reveals the limitations of his empirical approach. He roams widely throughout the globalised planet, capturing harsh contrasts of poverty and complex technology, with telling expressions like “I tweet in my dreams”. But he cannot probe the essence of real social and physical contradictions he so acutely observes. Drawing attention to Marx’s vision of how a future world could look, Mason notes the German revolutionary’s belief that human beings could free themselves from the wage system by developing more advanced forms of machines. Marx’s concept of human emancipation involved the negation of capitalism to free the productive forces – including technology – from the shackles of private ownership and the profit motive. Mason, instead, proposes that there can be a “semi-communal form of capitalism exemplified by open-source software and based on collaboration, management-free enterprise, profit-free projects and open-access information”. It is here that he shows the weakness of his approach. What he identifies in this phrase as “capitalism” is actually its polar opposite. The pioneering and creation of new forms of computing and networking such as the Internet, open source software like Linux, OpenOffice, Wikipedia and WikiLeaks as well as file-sharing, has been through people deliberately choosing to work on a non-capitalist, not for profit basis – usually in conscious and deliberate opposition to corporate control and profit-seeking. Their aim is to create and share free communication and information to benefit society as a whole. Of course there is a constant pressure to close down these systems or incorporate them into the interests of corporate profit making but this has been strongly resisted. Thus, high-level non-capitalist research and development, and collaborative relations between people actually do exist within the very heart of capitalism. Until its destruction under New Labour and now under the Coalition, the National Health Service was an example of such a living contradiction. Institutions formed at earlier periods of capitalist development like the National Gallery, the National Trust and many voluntary organisations are other examples. Mason’s hope, like that of so many others who anticipate that capitalism can somehow shed its spots and “grow over”, thanks to technology, into an acceptable form of society, is indeed completely utopian. He compares what he describes as “The Great Unrest 2.0” with the original Great Unrest, which took place before World War I when mass, unskilled trade unionism swept through the world defined by movements like the International Workers of the World, or Wobblies. He claims that the early 20th century syndicalists “showed a determination to live despite capitalism; to achieve something better than reform, but less than a full-blown revolution”. But in the aftermath of their struggles, the world experienced, two imperialist world wars, Fascism as well as other mass struggles against the status quo. Historically, the capitalist state has proved resilient in the face of sustained pressure, strikes and mass opposition. Even in grave crisis, it has not relinquished or ceded power – except to the military or fascist movements – with the exception of the Russian Revolution of 1917 (which Mason ignores). The experiences of the last two years do nothing to indicate otherwise. There are many positive sides to this brave effort to chronicle a year which jolted the world. Mason’s journalistic eye for the way in which extreme poverty and under-development live cheek by jowl with the highest aspirations, mediated through the mass use of communications technology in the most surprising places, makes his book a good, if uneven and sometimes frustrating, read. On the other hand, perhaps not too surprisingly, he does not go beyond doffing his cap to those he defines as the theorisers of power – Chomsky, Debord, Hardt and Negri, Sharp, Foucault and Deleuze. He does not explore the possibility it might actually be the influence of these sociologists and philosophers which contributes to an incomplete grasp of the nature of state power, let alone how to replace an increasingly delegitimized system with a real democracy. The notion that the new generations might use the technological revolution to go beyond resistance and enact social revolution, to seize and hold power from a mortally-wounded capitalism, seems quite simply a step too far for Mason. The upsurge of 2010-11 is already behind us. Surely it was a dress rehearsal for greater and truly social revolutionary struggles to come. These will need strategies, organisation and forms of networked leadership that take them beyond resistance and beyond capitalist rule itself. Like a lot of people, I'm an ex-Marxist and find the reduction of human meaning to economics inadequate. That said, I think this is an excellent review. Mr. Mason is a very bright fellow, & I'm enthusiastic about this book. Like the publication he works for, he is essentially apolitical, a technocrat with democratic impulses. That, I think, accounts for his perspective more than any ideological bias.